The AsthmaPal app, whose primary purpose is to predict the risk of an asthma attack, will soon be available at the App Store and the Google Play Store. Everyone suffering from asthma and chronic obstructive pulmonary disease (COPD) can use the app to monitor data about real-time triggers, their therapies and when they should take preventive medications. Also, app users will also be provided with a fully personalized training plan. The data say that there are around 440 million people suffering from asthma in the world, and the number grows by 10% a year. When it comes to the ex-Yu region, the numbers show that there are around a million patients. In Europe, patients spend around EUR 2,000 a year for treatments and asthma control. Filip Petrovic, one of the members of the AsthmaPal team, who presented the app at the recently held startup contest at the Science-Technology Park Zvezdara, says for our portal that the market for this project is large. – We are the first in the market to provide information about the risk of the next asthma attack. We are also the first ones to provide a personalized training plan for asthmatics, which is a very important part of our app, as it’s been proven that training improves the condition of an asthmatic patient in the long-term. Each user will be displayed fully adjusted and relevant data, making the app fully personalized. The main advantages of the app are that users can more easily organize their everyday activities, training and exercising counseling and education and information about the triggers. The app is, however, in a closed beta phase. It is currently used by a certain group of people suffering from this disease, so the app is constantly upgraded and adjusted based on the feedback. It will, however, soon be made available to everyone. – The app will become available to everyone at the App Store and the Google Play Store in the next month and a half to two months – Petrovic reveals for our portal. When asked what the investment is for the realization of this project and whether there have been negotiations with potential investors, Petrovic says that they are currently looking for investors and that the details are not yet known. – We are now looking for smart money, around EUR 50,000 plus counseling by the investor. We have had negotiations with certain investors, but that is all we can say for now. The next planned steps, Petrovic explains, are to upgrade the app and develop an IoT device. – After putting the app on the open market, the plan is to upgrade it with additional options which will provide added value for our users. Also, the development of an IoT device, the kind of which the market hasn’t seen yet, would make our service more complete. 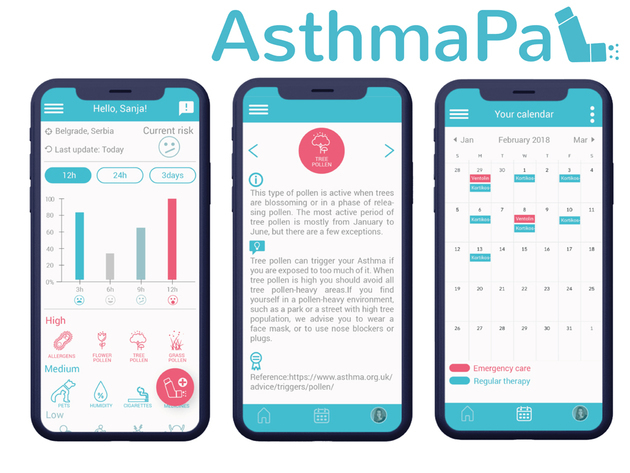 To register, users need to enter certain data about their asthma symptoms, which takes around 2 minutes, and enter the times when they’ve had asthma attacks in the app. Sophisticated machine learning algorithms and the data about asthma triggers then provide information about the direct risk of another attack and the data about the currently active triggers, with advice on precautionary measures, in case the user is forced to be in the vicinity of those triggers.